The Herma group has grown by 5.6 % in the past fiscal year, increasing sales to 361.3 million euros. 'Despite a noticeable economic slowdown', the company aims at an ambitious plus of four percent. With self-adhesive materials, labels, and labelling machines, Herma continues on the upswing. Just like in the strong preceding years with very constant sales increases, the group of companies has once again registered a markedly positive development in the fiscal year 2018 – despite an uneven global economy which is already slowing down in many places. In total, the self-adhesive technology expert with headquarters in Filderstadt posted record sales of 361.3 million euros (compared with 342.3 million euros in the previous year). This equals a 5.6 percent growth – the company had planned for just 3.6 %. Just like in previous years, this continued expansion results exclusively from organic growth. - We benefit from the fact that we are broadly positioned both internationally and across industry sectors, and are therefore able to compensate decreases in individual markets or fields through increases in others. In overall, this is the source of our long-term stability, say both managing directors Sven Schneller and Dr. Thomas Baumgärtner. The export ratio remained unchanged at 60.2 percent. Moreover, the company management is happy to announce earnings which provide Herma with the necessary funds to continue its course of investment and expansion. For 2019, however, a noticeable drop in earnings is expected, caused by high depreciation due to construction activities, a significant rise in personnel costs, and spiralling costs for some raw materials. After the first quarter of 2019, the managing directors see the group of companies on a solid course. - An ambitious sales increase of 4.0 percent despite a noticeable economic slowdown – from organic growth like in previous years. For the Self-adhesive Materials and Labelling Machines Divisions, we anticipate greater dynamics than for the Labels Division. With regard to the latter, we prefer further yield increases to pure growthexplains Schneller. 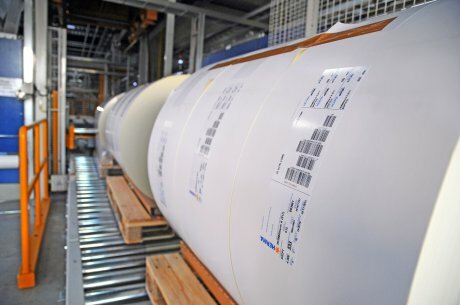 In 2018, the result of the Self-adhesive Materials Division was under particular pressure, as the dramatically increasing costs for some raw materials could only be passed on to customers to some extent. Measured by sales, the division once again outgrew the market: 215.2 million euros (204.1 million in the previous year) equal a plus of 5.4 percent. - We were able to gain considerable market shares in the important markets Germany, Central Europe, and the UK, says managing director Dr. Thomas Baumgärtner, who also heads the Self-adhesive Materials Division. The tense situation regarding raw materials also had a damping effect on the Labels Division. After 85.5 million euros in the previous year, sales remained almost stable at 84.7 million euros. - We are well on track with our strategy of long-term, profitable growth and have increased our operating earning power, says Sven Schneller. The Labelling Machines Division once again registered a strong sales increase, growing from 49.8 million euros to 58.1 million euros – a 16.6 percent leap. The continued internationalization of this division, which achieved strong growth especially through its own subsidiaries in Europe and the US, was an important factor for this success. And just like in previous years, the latest European pharmaceuticals directive, which is intended to provide better protection against falsified medicines for end users, played another role. Implementation is often carried out by means of special labelling solutions – and Herma, a technology leader, supplies individual modules or complete systems for that purpose. In 2018, the number of employees in the HERMA group as a whole increased from 993 to 1,051. For the current year, HERMA is planning to create 101 new jobs – related to, amongst other things, Herma’s most recent 100-million-euro investment in new production facilities and buildings at the Filderstadt headquarters. After the move of the Labelling Machines Division from Deizisau was completed at the turn of the year, a total of 919 employees now work in Filderstadt.